"Fig.1. Ball Costume in white faille, Princess shape, with very long train surrounded by three rows of ruches fastened in the centre by a delicate garland of tiny white flowers and foliage. The corsage is square-cut and has low short sleeves with plissés of crêpe lissé. A garland of loops of satin ribbon with flowers intermixed, forms the berthe behind and is continued down the sides of the front of the dress to meet a wide scarf of faille, which is draped diagonally across the skirt. A garland of white flowers with orange blossoms edges this scarf. Pouff of similar flowers in the hair. Fig.2. 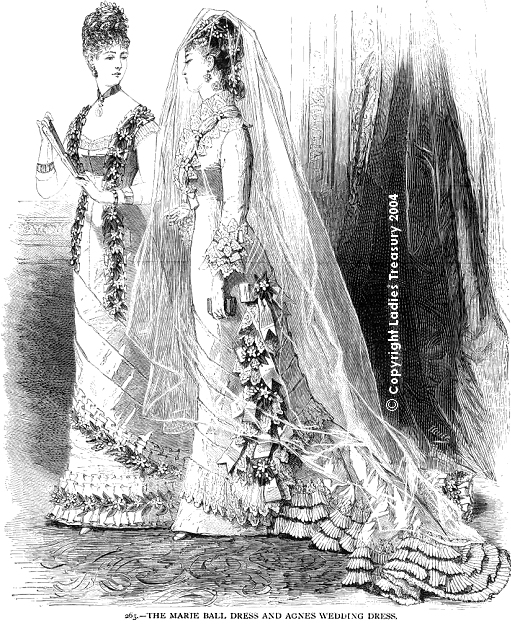 Wedding Dress of white faille, Princess shape; the train is trimmed with three plisses. A scarf of faille edged with a flounce of handsome lace is draped round the skirt. Coquille of the same lace intermingled with orange flowers and loops of satin ribbon ornaments on the left side. The corsage is open en châle and bordered with plissés of crêpe lissé. Rich fichu of lace with bouquets of orange flowers. Cuffs to correspond, of lace with bow of satin and flowers. Light wreath of orange flowers in the hair and veil of Brussels net, à la juive."